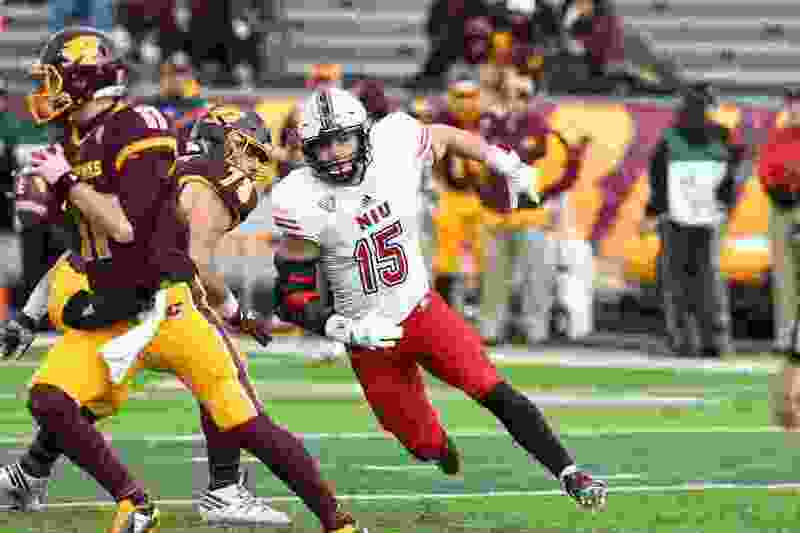 Northern Illinois defensive end Sutton Smith is a former high school running back who wears the same number as his team's quarterback. No wonder opposing offensive coordinators figure they can just line up bigger blockers and run the ball right at him. The strategy may be logical, but not necessarily effective. Even with schemes designed to account for him, No. 15 for the Huskies is one of the most productive players in all of college football. Athlon Sports ranked him the No. 3 player among Group of Five schools, and the two players ahead of him are quite famous: Houston defensive lineman Ed Oliver, the likely No. 1 pick in the NFL draft; and Central Florida quarterback McKenzie Milton, who led he Knights to an unbeaten season in 2017. That makes Smith the best player you've never heard of, and Utah will face him Saturday night. Northern Illinois' other big-time performer has the body you would expect to see from an offensive tackle. Max Scherming is 6-6, 320. Smith is built more like a safety at 6-1, 237, but he's really good at getting around offensive linemen and chasing quarterbacks. Pro Football Focus made him the highest-graded returning edge rusher in the FBS in 2018. 1 – Ed Oliver, DL, Houston. 2 – McKenzie Milton, QB, Central Florida. 3 – Sutton Smith, DE, Northern Illinois. 4 – Devin Singletary, RB, Florida Atlantic. 5 – Andrew Wingard, DB, Wyoming. 6 – Max Scharping, OL, Northern Illinois. 7 – Penny Hart, WR, Georgia State. 8 – Anthony Johnson, WR, Buffalo. 9 – Mason Fine, QB, North Texas. 10 – Brent Stockstill, QB, Middle Tennessee. Smith led the country with 14 sacks and 29.5 tackles for loss last season as a third-year sophomore, after recording only one sack the previous year. And he’s not thriving only against Mid-American Conference opponents. Counting last weekend’s 33-7 loss at Iowa, Smith has faced four Power Five teams in two seasons and totaled four sacks — one vs. Boston College, two vs. Nebraska, none vs. Duke and one vs. Iowa. He got to Iowa quarterback Nathan Stanley in the second quarter Saturday, as the Huskies trailed only 3-0 at halftime. The Hawkeyes' approach to dealing with Smith included calling only a few dropback passes and frequently using two tight ends and two running backs to wear him down with double-teaming or take him out of the play by running to the other side. So the Huskies will move Smith around, trying to keep Utah guessing where he'll be. And they'll rely on offensive tackles Jackson Barton and Darrin Paulo doing their jobs well. The Utes will try to maintain a wide pocket around quarterback Tyler Huntley and sustain their blocks on Smith. Harding was disappointed about the way his linemen — and the entire offense — began last week’s opener vs. Weber State. Huntley was sacked once and pressured often in the first half, while running back Zack Moss had trouble getting going. Six of Moss' first 12 carries went for 2 yards or fewer, including two lost-yardage plays and no gain on a fourth-and-1 run. The consolation was he turned the next handoff into an 86-yard touchdown, but Harding was displeased with his line’s lack of consistency. He’s looking for a more steady showing from start to finish Saturday. Smith will try to be as disruptive as ever, while hoping for help from his teammates when the Utes are preoccupied with him. When • Saturday, 5:30 p.m.